The eAdmin solutions of eClass aims to digitalize schools’ administrative workflow, reduce school staff’s administrative burden, and improve the overall efficiency of school management. 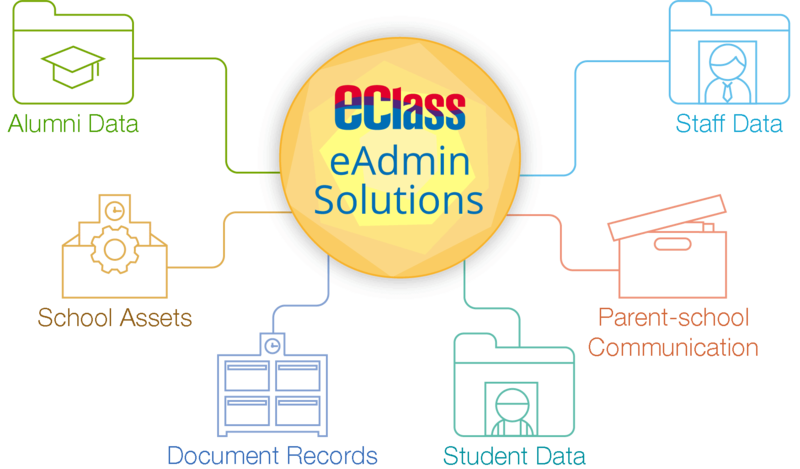 eClass platforms and a myriad of eAdmin modules are designed to handle and manage the administrative duties related to students, teachers, documents, assets, etc. Student Data Analysis gathers all data of students’ internal and public exam results, by which the school can track their past results for subject-based and class-based comparative assessment and analysis. The system is able to generate reports such as ‘year-on-year exam results statistics’, ‘individual comparison’, ‘public exam results assessment’, etc., which would be useful for teaching reviews to improve teaching and learning outcomes. iPortfolio is a multifold assessment tool that records students’ learning activities and performances, which will assist schools in identifying students’ needs and tracking learning progress in time. Each school can make use of iPortfolio for different purposes and establish their school-based assessment plan such as personal growth, career development counselling, and students’ ability assessment. eAttendance greatly reduces the workload of recording attendance of students and staff. 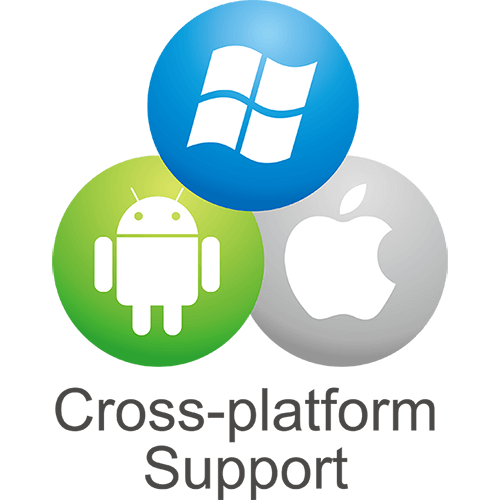 The system is fully consolidated with eClass Smart Card Suite and eClass Apps, and the data can be directly imported into WebSAMS and iPortfolio, simplifying the tedious data entry process. eReportCard helps the school manage students’ tests and exams statistics, and prepare term report cards. It incorporates various functions such as online scoring, automatic score calculation and sorting, score appeal system, report card formatting and report card printing, with data linked to WebSAMS and iPortfolio. eDiscipline is designed for organising and managing students’ disciplinary records. Teachers can easily input data or review the records according to the school’s custom disciplinary rules, such as the merit system. All data is importable into WebSAMS and eReportCard. eEnrolment is a one-stop management system of student activities, featuring online application, applicant screening, electronic payment collection, attendance taking, attendance analysis, etc. which would help save tremendous administrative costs and manpower. eLibrary plus centralises the management of both printed and electronic reading resources (e-books, e-magazines, videos, multi-media publication, etc.). It allows teachers, students and parents to access their personalised library, where they can view library updates, book ranking and personal reading record, etc. any time via tablets or computers. Incentive Scheme is a brand new eLearning rewarding platform for the school to digitalise students’ performance records and reward them accordingly. Through the system, teachers can give scores to classes, individuals or activity groups, and when students score to a certain level, they can redeem their rewards. Parents can also view their children’s performance via eClass Parent App. The eClass Integrated Platform is seamlessly integrated with the eClass Parent App, eClass Teacher App and eClass Student App, with which parents and teachers can receive information, such as eNotice and attendance record, and communicate through instant messaging and group messages, in order to create better parent-school relationship. For teaching staff, no extra training is needed to learn a new system, as they can deliver information to the eClass App just as they usually do on the Integrated Platform. Staff members can find their timetables, rotas and attendance records (including arriving, leaving or off-site work period) on Staff Attendance. The work hour count facilitates salary management. Staff Appraisal enables a systematic approach of appraisal and self-assessment. It provides digital forms for stakeholders to conduct assessment during specified times, which would reduce the workload of print document routing. Delicate user-right settings ensure that privacy is well-protected during the appraisal process. Schools may assign roles (eg. subject group leader), lesson viewing and homework cross-checking duties via system settings. Staff members will receive reminders to complete assessment and submit progress report through the eClass Teacher App. All reports can be generated as PDF files. Teacher Portfolio systematically records and manages the data of teaching staff over the years, including classes they taught, administrative contribution, attendance and continuing studies. It facilitates the school to promote professional staff development and improve human resource distribution. The system provides the staff with various interfaces for data entry and uploading relevant files or certificates. The data is integrated with Staff Attendance and Staff Appraisal, and can be exported as CSV or PDF files. Digital Channels is where the school can build an interactive stream of photos, videos and other multimedia files recording the campus life (eg. school picnic, class segments, competitions) of students. It can be browsed by teachers, students and parents. System administrators can categorise the files according to time, subjects, student events, etc, create albums and add tags to the items for easy access and management. Document Routing helps the school establish a document circulation process and keep records of draft reviews, opinion collection, approval seeking and progress tracking, etc., with custom access rights. Not only can it improve the transparency of administrative work, but also facilitate division of labour and monitoring of workflow. Digital Archive highlights centralised storage, convenient searching and security. It accomplishes the revolutionary concept of file access by storing all documents of the entire school in a centralised digital archive that is easy to search on and monitor. It also promotes paperless administration, as the platform is readily accessible across laptops, tablets and smartphones. The annual sports gala is an important event for every school, and it often takes much time of students and teachers to prepare for the event, such as enrolling and grouping participants. With eSports, students and teachers can fully enjoy themselves in the sports gala as the system is specially designed for ensure a smooth day for the school. Event helpers may simply use the system to automate groups, schedules, ranks and prizes, etc. eProcurement handles various merchandising and bidding tasks within the allocated budget for different kinds of tenders. The school can customise access rights to allow relevant users to view tenders and participate in the decision making process. The system will generate procurement timeline for each job highlighting the different procurement stages. The system managers can generate all merchandising reports for offline storage. eInventory centralises the management of all school items systematically, which relates to the source of funds, specifications and ownership, etc. Integrated with the eBooking system, it helps simplify the shift in assets, including categorisation, registration and asset audit, The system can even facilitates inter-school assent management within a school network. eBooking gathers all the bookings of rooms, facilities and equipment under one roof to save manpower from traditional procedures. It allows students and teachers to make bookings easily on the Internet, and the school may review the usage of all facilities at any time to ensure proper use of resources. This module is fully compatible with “my calendar plus” in iCalendar, so one is able to book venues and resources immediately after creating a calendar event. eAlumni is a one-stop platform for managing alumni’s information: the school can categorise members, hold registration, collect fees and renew memberships. Alumni can update their personal particulars upon successful registration. System administrators can send emails to registered alumni to keep them updated about their alma mater. Alumni Tracking is an interactive digital platform specially designed for graduated students to view their past activity records in school, study path and career information all at once. These data, such as public exam results, university major, career field, can be generated into statistical reports for the school to keep track of their alumni.